There are a few shoes on my wish list to try in 2017, including the Saucony Freedom ISO, Hoka One One Hupana, Nike Zoom Elite 9, and the Salming EnRoute, but none of them are as light as the new Skechers Razor. Having previously reviewed the Skechers GoRun 5 for RoadTrailRun.com here, I was looking forward to seeing how the Razor would stack up. 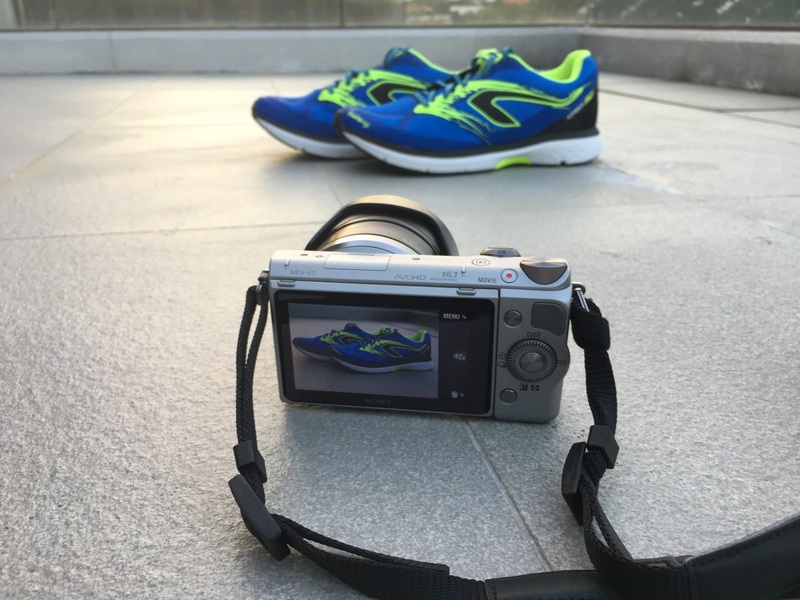 I’ve put in many more runs in the Skechers GoRun 5 since my initial review, and the one small beef I have with the shoe is that the balls of my feet tend to get a little bit sore past the 90-minute mark with this shoe. It could well be that the foam just softens up a bit too much in the warm Singapore weather, and I was hoping the Razor would be firm enough without being too jarring for me to use as a suitable long run trainer. My long runs tend not to be overly fast, but my long run shoes need to be able to adapt to variations in pace because some of these runs can be rolling and the downhill sections could be done at close to 6:00/mile pace. Despite using a denser, firmer iteration of their new 5GEN midsole foam, the Razor surprisingly still comes in at essentially identical weight to the GoRun 5. I seldom comment on the aesthetics of shoes, but the Razor, like the Saucony Freedom ISO, is hands down one of the most eye-catching shoes of 2017 for me. In fact, if Skechers play their cards right, this could be their ticket into the Nike and Adidas-dominated sneaker world. One of the things I mentioned about the GoRun 5 was the wide spacing between the lacing eyelets allowing for a fairly loose overall fit. Well, the Razor is having none of that. It has a much more closely arrayed row of eyelets as well as a less elastic knitted mesh upper. One might think that this creates for a snug overall fit, but it is actually one of the roomiest shoes I have ever tried, so much so that I’ve ordered another pair a half size smaller. Skechers’ sizing in general has always run a bit big for me, and though I fit well in a 9.5 for the GoRun 5, the Razor in this size has given me a full 1.5 finger breadth of space in front of the toes. I let a buddy try them on, and even he found these US9.5s to be the right size or slightly long, and he normally wears a 10.5 for Adidas and a 10-10.5 for most other brands. The arch structure is also not overly restrictive, which surprised me, since Skechers billed this as Meb’s main marathon training shoe, and Meb has crazy narrow feet and high arches; if you ever tried a GoMeb Speed, you would know what I mean. That makes this shoe a very good candidate for people with low arches, but who are neutral runners, as is the GoRun 5. Come to think of it, there aren’t many good low arch neutral trainers on the market these days, let alone uptempo trainers. The only thing close that comes to mind is perhaps the ASICS Tarther Japan. I normally do not put much tension in my laces in most other brands, because I have low arches and an accessory navicular bone in each foot, which causes pain if I have an overly snug midfoot. I often sacrifice a secure fit for comfort in these cases. By contrast, with the Razor, I was able to tighten the laces a lot in the midfoot and even the toebox to get a good secure fit without causing any pressure points, and the overall fit was very secure, stable, and comfortable. In summary, I would recommend sizing down a half size for the GoMeb Razor. This might just be one of those shoes you are better off getting in a brick and mortar store than going cheap online, or it could get expensive. The GoMeb Razor utilizes a single density layer of their new 5GEN foam, which I understand is injection moulded, much like the GoRun 5, but while the GoRun 5 has a very soft and bouncy feel, the Razor has a firmer snappier feel. The ground feel is fairly low for a shoe in this weight class though; the Adidas Adios Boost 3 for instance offers a significantly firmer ride. The GoMeb Razor uses the same outsole webbed outsole rubber pattern as the GoRun 5. Again, you can read my beef about it here. However, i must say that Razor somehow feels more stable on wet surfaces. It could be that there was some minor update to the compound of the outsole between the time the NYC GoRun 5 was released, and the time the Razor made its debut. 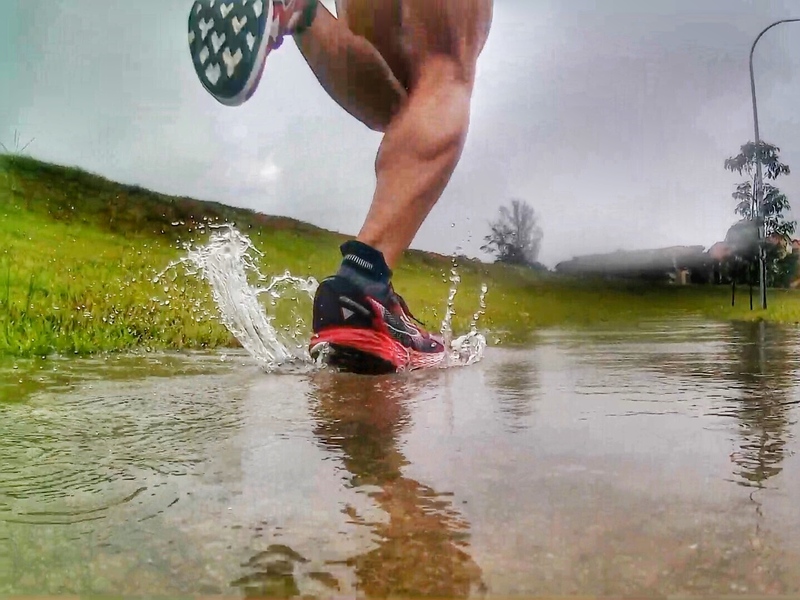 The more likely explanation is that the Razor's firmer heel makes the shoe just a little more stable on foot strike and that just gives it a more surefooted ride on wet surfaces. Either way, i did notice that i was more confident on wet pavement in the Razor. Most baffling. The Razor definitely rides firmer than the GoRun 5, but the high stack of the shoe, especially in the front half of the shoe really helps to dampen down the road vibration. Overall, I found the ride to be similar to that of the Brooks Launch 4, but with more vibration dampening so there is less ground feel. If you are more prone to land mid- or fore-foot, then you will appreciate the Razor’s lower drop and thicker forefoot cushioning. I recently did a sort of comparison run over 4 loops of rolling hills for an hour in both the Razor, and the GoRun 5, one week apart. It was mainly on the downhill sections that the GoRun 5 excelled due to the softer, and bouncier ride. Both shoes felt near identical on the uphill grinds. On the flatter sections, I actually preferred the Razor and the firmer compound made the transitions from foot strike to toe off more fluid and snappy. I've also put the Razor through a long-ish run of 26km on rolling hills, and the shoe has done a solid job of absorbing shock. It's been a long time since i liked any shoe other than a Hoka (Clifton / Odyssey / Valor) or Adidas Energy Boost for long runs, so to find something i like in a very light and firm shoe like the Razor is just remarkable. Both the Razor and GoRun 5 have near identical stack heights and weight. The GoRun 5 has the more elastic and comfortable upper for me, but it is also noticeably less structured and some people may find that the upper does not provide enough security and lock-down for their liking. For them, the Razor would be a better option as it has a more rigid and structured upper. Both uppers are equally breathable for me, and work very well in warm and humid weather. The rest really comes down to what kind of feel you like in a shoe. If you like softer shoes like Hoka Cliftons and ASICS Hyperspeeds, then the GoRun 5 would work much better as a daily trainer or uptempo shoe for you. If you like firmer shoes like a Nike Zoom Streak 6 or Brooks Ghost/Launch, then the Razor would be the right fit as an uptempo trainer or marathon racer. I previously reviewed the Kinvara 7 here. The new Kinvara 8 is softer and bouncier than the Kinvara 7 but I do not have enough experience in it to give a fair comparison so I shall make comparisons to the 2016 K7 instead. The Razor feels like it has a similar overall firmness to the K7, but despite their near identical stack heights (23mm/19mm for Razor vs 22mm/18mm for Kinvara 7), for some reason the Razor feels like a much more cushioned shoe. The Razor feels higher off the ground, with much less ground feel during runs. In terms of flexibility, the Razor loses out as the 5GEN midsole here is fairly stiff, so if you like a shoe with more forefoot flexibility then the Razor is not a good option for you. Perhaps give the new Kinvara 8 a try for that. If you liked the Kinvara 7 but want something that feels more cushioned for longer runs then the Razor would be a good option for you to try. The Razor is slightly lighter than the Clayton, though this is not really noticeable. The Razor also has a much more forgiving fit for a wider range of foot shapes due to its fairly roomy fit. I think fit-wise, the Clayton would really only fit better for very narrow feet. In terms of ride, the razor feels less jarring for me than the Clayton, especially if you use the stock insole provided by Hoka, which is very minimal. This may be somewhat surprising, as the Clayton has a 28mm(heel)/24mm(forefoot) stack height which is significantly higher than the Razor. (For comparison, the Adidas Energy Boost has a 27mm heel stack and the ASICS Nimbus 18 has a 29mm heel stack). However, while the cushioning in the Razor (and indeed most shoes) stems from the midsole, the compressibility of the Clayton comes mainly in the RMAT outsole while its midsole is fairly firm and stable, especially in the front half of the shoe. The Clayton’s prime advantage is in terms of grip. The Clayton wins hands down in both wet and dry grip, due to its softer and sticky RMAT outsole. If your runs are often over slightly technical terrain or have sharp corners, then the Clayton would be a better choice for you. With a retail price of US$110, the Razor is US$40 cheaper than the Clayton, so in terms of value, the Razor is hard to beat. The Razor works very well as an uptempo trainer, and will work well as a daily running shoe for some people who like a firmer feel. The sizing is a little bit tricky as the stiff knit upper gives the shoe an inordinately roomy fit, and i think many people can afford to size down on this shoe by a half size. Hi would like to know where you bought the pair of Razors from. Thanks!